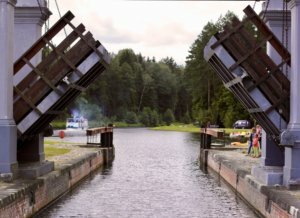 Belarus is considering the possibility of building a river port on the Dnipro River in Gomel region near the border with Ukraine in order to use river-sea vessels to put out to the Black Sea. The Turkish investor Derin Shipping & Trading Co. might be involved in the project. According to the state agency BelTA, Ambassador of Belarus to Turkey Andrei Savinykh states that the implementation of the project “will turn Belarus into a maritime state.” The project could be implemented by building a port terminal in the village of Nizhniye Zhary (Gomel region). “Our Turkish partners are considering the possibility of building a port in Nizhniye Zhary, which will turn Belarus into a maritime state,” the official told journalists in Gomel during the visit of the Turkish delegation to the regional center. It is assumed that the main volume of cargo turnover will be provided by oil products (Mozyr Oil Refinery is located near Gomel) and Petrikovsky GOK being under construction in Gomel region (the project of Belaruskali, the capacity is about 2 million tonnes of potassium chloride per year). The average term for booking rooms in hotels of the southern region of Ukraine after the summer 2018 season fell to four days from seven a year ago, Ribas Hotels Group Executive Director Andriy Marenchuk has told Interfax-Ukraine. “If we evaluate the overall [summer] season, we can say that it was not easy… The booking period in the southern region was significantly reduced, the early booking period also. The average booking duration for this season is four days, and last year it was seven day. This is one of the main factors for assessing the tourist market,” he said. According to Marenchuk, a decrease in this indicator indicates a low level of the marketing product of most resort hotels in the country. He said that Karolino-Buhaz, Hrybivka, Ochakiv, Zatoka and Koblevo became resorts of the “last minute,” that is, they are chosen as the last resort if tourists could not go to a foreign resort. “This is the worst marketing product of the existing ones. It is bought last, because other factors did not play: for example, there was not enough time to go to Egypt or Turkey for 10 days, so we went to Zatoka for three days. Why there were queues at the Moldovan border on Thursdays and Fridays? People from Moldova went for a weekend. These are not tourists from Belarus or Ukrainian guests who came for five to seven days,” the expert said. He also said that in the struggle for a guest who prefers to come to Ukraine for a long time, domestic resorts lose to foreign ones, primarily because of the lack of a developed hotel infrastructure. “If in Turkey a hotel is built on average with 300 rooms, then in our region such a facility is considered very large. And if a hotel has a small number of rooms, then it is unprofitable to build a pool, install water slides and other entertainment infrastructure,” the expert said. At the same time, Marenchuk reported on increased competition with Carpathian hotels. “We have a rival with rapidly developing tourism like the Carpathians. The mountains are considered not only from the perspective of the winter resort Bukovel. Many Carpathian hotels have begun to use the summer season. Today only the sea saves us [the Ribas Hotels Group],” Marenchuk said. In turn, the founder of the company Ribas Hotels Group, Artur Lupashko, said that the operator’s hotels showed a consistently high load this year. “Loading of our summer hotels this year has fluctuated at the level of 68%. Traditionally, the most active months [July and August] showed 76%. June sank a little at 58%. For owners or investors of the southern region, this means profitability of resort hotels of six to eight years and the return of 12-16%,” he said. Ribas Hotels Group (Odesa) LLC was established in 2017. According to the unified public register, Lupashko is the head of the group and holder of a 100% stake in the company’s charter capital.